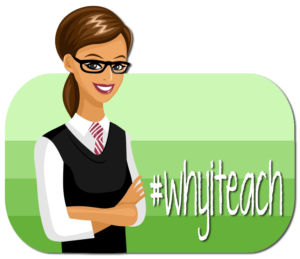 I have been pondering my answer to this question since Mindy Dennison challenged #oklaed on Sunday to blog about why we teach. Over the past (almost) week, I’ve pondered my answer, trying to narrow it down to about 500 words or so. I can come up with a pithy phrase, like “I teach to make a difference,” but that isn’t enough. In order to really communicate why I teach, I have to tell stories. These aren’t just my stories, but the student’s stories, too. For that matter, I’m not always the “hero” of the story — sometimes, I’m just the bystander having the honor of witnessing the growth of a human being. For that reason, I’m going to spend the next few days writing the stories that have stayed with me over my years of teaching. Together, they all answer the question of why I teach. Let’s start with Laura’s story today. However, Laura struggled with confidence in her scholastic abilities. Our school had a computer program called Achieve 3000 and carts of 25-30 Macbooks in each English classroom. Once a week in English class, we’d pull out the computers, and students would choose articles to read from thousands of news stories that had been re-written into 12 different Lexile levels. The program provided a pretest at the beginning of the year to set a students reading level, and as the student read and responded to the quizzes, it would increase their lexile level accordingly. The program would give students badges making good grades on the quizzes, but I knew that wasn’t enough. My middle school kids needed something tangible. So I created the 100 Club, in which students who made a 100 percent on a quiz would receive “chocolate, gum or a Dum Dum,” the opportunity to give their celebrity interview during the last five minutes of class (What is your secret to Achieve success? ), and the privilege of lining up at the door and being the first ones out as soon as the bell rang. Everyone else had to wait for me to release them by row, per my usual routine. Laura consistently scored very low on her quizzes. She pouted, she talked about how dumb she thought she was, and how she was never going to make a 100 percent. She also mentioned frequently how much she hated reading. I knew from her responses in class to stories we read that Laura was not dumb. I suspected something was going on when she was taking the quizzes that prevented her from scoring well. Fortunately, I had a co-teacher in that class, so I was able to sit down with Laura and watch while she took the quiz. After observing her, I discovered that she wasn’t referring back to the article, and even if she did, she would second-guess herself. So I worked with her over the course of a few weeks. We’d read the story together, and then she’d talk me through her process of eliminating the wrong answers and verifying the correct one before clicking the submit button. Sometimes, I’d have to ask her to explain an answer, and she’d discover that wasn’t the correct one — perhaps she’d needed to read further down in the paragraph to find the right answer. Because I was able to sit down with Laura and work with her one on one, she became one of my top scorers. Beyond that though, she learned to work through her confidence issues and develop a process to help her success. This skill is absolutely transferable to the real world. I had Laura in my class for two years, and I had the honor of seeing her grow into a much more mature young lady than she had been previously. Filed Under: Education Analysis Tagged With: Why I Teach?